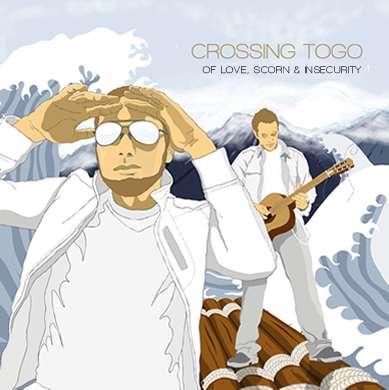 Crossing Togo "Of Love, Scorn & Insecurity"
So with all these names involved in the making of the album, one would expect a world class production and in that aspect the CD is truly flawless. The style overall could be described as folky-eclectic, with occasional touches of other genres such as pop, latin, rock . The overall impression of the work is that the title fits well with the mood that the album creates. For the most part the tempos are slow and moody with some occasional upbeat song splattered throughout. The musicianship is there and so are the vocals but my main issue with the CD is that a lot of the songs seem to blend into each other. It suits a lazy Sunday afternoon perfectly as you can really sit down and relax with a homemade cigarette to this one. It would make you think about the state of affairs or elicit memories of lost love or opportunities. It could also make you fall asleep. There really isn't anything there to make you move in any other way but in sombre melancholy fashion. Maybe track #6 "Walk" stands out as the best piece as it moves in a more non-linear fashion and elicits more of a different feel than the rest of the album. It is also the most rocking track on the CD. I personally would've liked to hear more variety, maybe a few more rockers, a classical ballad, or maybe more vocal variety which is possibly the biggest problem. Ko is definitely a very capable singer but he seems to stay in a comfortable zone that he never leaves. I don't hear him straining a nerve anywhere on this CD and so does the rest of the crew - it seems that they are just phoning it in. Which brings me to my next point - that maybe a raw local pub production approach with all the warts and mistakes might've added another dimension to this album. Or maybe the fact is that I am not really suited to melancholy music since I am writing this on a Friday afternoon?